Ibrox Noise: 2018-19 Review: has Gerrard's first year at Rangers been a success? 2018-19 Review: has Gerrard's first year at Rangers been a success? Steven Gerrard’s first season as Rangers manager – and first season in management – is coming to an end. Like any season in football, it has had its ups and downs. But on the whole, how has Gerrard’s first season gone? While many were critical of the decision to take on a manager with no real management experience, they couldn’t grumble too much with a run of twelve games unbeaten in the league, Europa League qualification stages and League Cup. This was, as many would expect, brought to an end with a defeat away at Celtic in the first Old Firm derby of the season, leaving Rangers seventh in the Scottish Premiership. However, Gerrard’s side went on to win 8 of their following 10 matches and climb to the top of the league. The remainder of the league campaign was a bit hit and miss, combining strong 4-0 wins over the likes of St Mirren and Dundee with drab draws against Hibernian and St Johnstone. Arguably the highlight of the season came in late December, with Rangers beating Celtic 1-0 to win their first Old Firm derby in 90 minutes since 2012. In just their third season back in the top flight, nobody was expecting Rangers to win the league. It’s hard to complain with the probable second place finish. The two domestic cups provided Gerrard with a real chance of silverware in his first season as Rangers manager. Unfortunately, his side were undone by Aberdeen on both occasions. After strong wins against Kilmarnock and Ayr United, the Gers suffered a slim 1-0 defeat to Aberdeen in the League Cup semi-final. Fast-forward to March the following year, and Rangers were drawn against Aberdeen again in the quarter finals of the Scottish Cup, after seeing off Kilmarnock over two legs in the fifth round. The tie was forced into a replay after a 1-1 draw in Aberdeen. Advantage Rangers, surely? Unfortunately, their old foes struck again, beating them 2-0 to earn a tie against Celtic in the semi-finals. Celtic went on to knock Aberdeen out of the cup, and will face Hearts in the final, where they are huge favourites according to Redbet. European success is the ultimate goal for any club – and Rangers are no different. Things looked promising after an unbeaten qualification stage. Rangers overcame Shkupi, Osijek, Maribor and Ufa in July and August to progress to the group stage, where they faced stiff competition from Villareal, Rapid Wien and Spartak Moscow. The highlights? An emphatic 3-1 win at home to Wien and managing to hold Villarreal to a draw on both occasions. However, Rangers failed to see off Spartak Moscow at home, and lost to the Russians – who eventually came bottom of the group – in the away tie. Unfortunately, this saw them knocked out of the competition, with a 1-0 loss in Vienna putting the final nail in the coffin. Has Gerrard’s first season been a success? While he hasn’t earned any major honour or silverware, he’s kept Rangers on the up after some seriously unstable times for the club. Moving forward, a few strong signings could see the Gers make a serious challenge for the title and both Scottish cups or even make it through to the latter Europa league stages. We'll hand it to you; how do you see his maiden season as Rangers manager? From a business point of view a huge success. From playing point of view a slight disappointment in cups. But 2nd place in league assured giving opportunities in last few games for a few youngsters. Notwithstanding some horrendous refereeing decisions,injuries, and lamentable administrators in SFA and having to contend with constant harping from IN I think SG and McAllister have done well. A good window to come and next year will be ours. I think he will have learned a lot this season. From bad tactics at Celtic and decision making at Motherwell, to failing to punish teams and see them off. I don't expect him to make the same mistakes next season. He will also have a much better idea of the stresses and strains of managing a club the size of Rangers. As well as a better understanding of what players need to succeed here. Some of his buys have not delivered. On the plus side, he had to get rid of a lot of deadwood this season and is still left with some. Summer 2019 will need less deadwood shifting, but still some. This should allow him to concentrate on areas that need strengthened. We need at least one decent CB (Halkett is as good as Souttar and was free, FFS) I don't know if there are any good ones in the Unders ready to step up. Midfield we have enough, or more than enough. Some will have to be eased out to make room for the youth coming through. I would like us to try Docherty in the AM/No 10 role. Wings, we seem to have more than enough. Hastie would be worth it if not too expensive, bring Middleton back into the first team, try him left and Kent right, or one of them in the middle. But we need another striker. Maybe two. If Morelos goes, we will have money to spend, but would like to see us tie up someone first. I would like us to bring Shankland and Rudden into the first team squad. Lafferty has not worked out, should be encouraged to seek a new challenge. Shankland will cost pennies, so if he doesn't rise to the occasion will cost us less over a 3 year contract than Herrera has each year, or his fee!! Those 2 and Defoe would need another quality striker if Morelos leaves. It's a failure for me. Those beggars have been there for the taking all season, and our inconsistency let us down again. All tippity tappity Warbuton style football. Gerrard failed miserably in the January window, and since the old firm win, we have been below par at the very best. We had the sheep twice in the cup,, and twice they put us out. The Ibrox quarters against them was absolutely unforgivable, criminal and totally outrageous play!! We have handed the beggars the treble treble on a big fecking plate as well as 8IAR. Our players, bar one, are not league winning material. They have shown that throughout with the results. They just don't have the required winning mentality or bottle for it! Celtic are now in line for doing 9IAR. 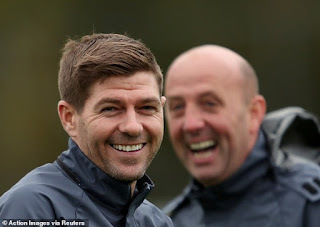 Do I think Gerrard and the current crop of players can beat and prevent them from doing it?, No, I just simply don't!! It will be same shite, different season next term! There is nothing to suggest otherwise as Gerrard will play the exact same way, regardless what players he has! OK, Jimbo, I am listening. What should SG do next season? Who should he buy and how should he set the team up? If you think he is the wrong guy, who do you want instead? A rough idea of the cost of buying the players and manager should also be included, with an estimate of the cost of getting rid of the people you want out. Then I and everyone else can see whose vision we prefer, yours or SG's. Apologies for delay Scots, just noticed your comment. I've said many times on here, my favoured manager would be Jurgen Klinsmann. As for the players Scots. Thats the scouts job to look at the footballing worldwide to see who would suit our game and be able to handle the weight of the blue jersey. My biggest complaint of the season is that Gerrard rotated the team far too much to accommodate Europe. Defence - My preference would be Katic/Goldie for CB's, Goldie being captain. Keep BB, Joe Flanagan and Polster, get rid of Tav. Midfield, McRorie, Jack, Arfield, Coulibaly are all too similar, they have not skill or talent to get by players and make the killer pass on a consistent basis. We need at least 3 skilful midfielders who can change games!! Id give Steve Davis another season, he is starting to produce in games. Klinsmans game is all about attack and penetration into defences. A german mentality of win win win and installs that same mentality into his players. I'm not expert either Scots, but I know when I see a player in the Blue jersey, I can see very quickly if he is league and cup winning material for Rangers. And right now, if we don't change that team and Gerrard with it,,then we will def be fighting for 2nd place again with no cups!! Scouts need to do a better job also! Jimbo, no problem. I like some of your ideas. I agree with your defence, although I am not convinced any of the RBs would be better than Tav. On midfield, I think Coulibaly will go but I don't see Arfield doing the same job as McCrorie or Jack. He plays and should be playing much further forward. Didn't have as good a game today as last week, but has to play AM or similar, not CDM. I was very against Davis, but am starting to change my mind now he is getting up to speed. Klinsman is an interesting thought, I don't know what he is doing just now. But I would have thought he would be way out of our budget, to be honest. We will all have a better idea of the scouts abilities by September, I suspect. Kamara has been a steal, Davis and Defoe have been good but depends on how much wage we are picking up. So, all in all, I am reasonably happy just now. i wish to f that we would do our talking on the pitch..
all this shite been a success ! please please shut the f up what have we won!!. I dont think its been a flop but its also not been a success. Stevie maybe should have stuck to learning how the game in scotland is played, by that i mean there was to much going on for his first season imo. Europe, cup games and the league. Best chance for years to displace the filth wasted and so many points lost.There has to be a very big improvement next few games and into next season for Stevie to be truly judged of course. Sell Morelos and get a few more off the wage bill and rebuild but im not overly excited at the alleged targets so far. To be fair to SG, he 'inherited' a few problems. Finally got rid of Mr Useless Herrera. (yes). Any supporter with half a brain, knew we would struggle to win the league, this season. Apart from his strategies sometimes being a little off, I think some players from last season and some in the first team now, just are no 'cutting the mustard'. There's been way too many players bought, that ended up just a burden. It bloody annoys me, that Rossiter has turned into 'Mr un-injurable, at Bury. But was as much use as a chocolate fire poker, for us. Same with Lafferty. A great disappointment. But given what happened to our club, we were always going to have to claw our way back. So with all that AND Alfredo's antics, I think we are tbh, where we deserve to be. We need to clear-out the deadwood and learn lessons from this season. We'll catch the Celtic. It's only a matter of time and buying the right players We still need to keep realistic. Yes, for a newb Manager, I think he's done pretty well, with what he has had to work with.